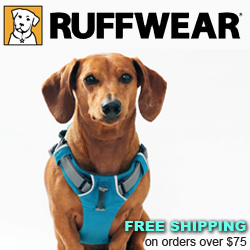 Disclaimer: this post and giveaway is brought to you by Ruffwear and does contain affiliate links. 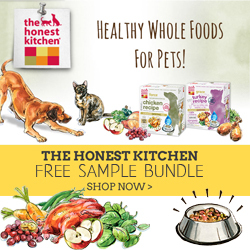 All opinions are my own, and I only share products I think you and your dog will love! It’s that time of year when one of my favorite pet companies, Ruffwear, comes out with their new Spring gear! I was super excited this time around to be able to test out their new Slackline Leash. At first glance it may look just like an ordinary dog leash, but I can tell you it is not. The Ruffwear Slackline Leash is an adjustable-length leash from 6 feet to 3.5 feet. Its adjustable length can be fully extended for relaxed walks, or shortened for more control as needed. Essentially this leash replaces those highly dangerous retractable leashes – which I don’t really recommend. Mom and Dad love the padded handle which also includes a convenient accessory loop for pick up bags or small clip-on items. The Slackline leash can also be handheld or waist-worn with the handy buckle, which also makes it easy if you ever need to tie your dog while out on a walk. It’s also got reflective trim for safety, and comes in 4 fun colors: Twilight Grey (pictured), Meadow Green, Purple Dusk and Kokanee Red. And incase you are wondering, there is still plenty of length to this leash when extended to allow me to explore all the fascinating places I find on my walks! And can still quickly shorten when I need to stay closer to mom and dad. The Slackline Leash has been great for my walks to work in the morning, where sometimes I need to stay closer to mom incase of oncoming traffic. But don’t worry, I also always practice looking both ways before I cross the street (as seen in the video above). You can fetch the new Ruffwear Slackline Leash for your dog for $39.95 (with FREE SHIPPING for orders over $75)! Osgar sure would love to win this!! He’s being a shop dog today too. Our leashes are ruffwear, we’ve had them for years and we love them! Love the black and gray one! I love that it can be worn around the waist 🙂 My favorite color is the Purple Dusk. I love this thing and my favorite color is Purple Dusk. Oh I forgot—I really like that green one—it’s nice and bright!!! Loves ya!!! The purple would compliment my two girls nicely! I’m sure they’ll look stunning and be extra safe with this leash. Our favorite color is the purple dusk. Well, that’s Sammie’s favorite. Ruby likes the kokanee red. Penny likes the twilight grey. 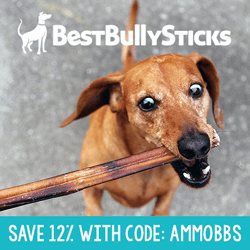 This is a great idea to replace our retractable leashes! Hi Ammo, you sure do offer excellent give away products. I like the kokanee red. Do I spy a poop bag on your lease from Baxter’s mom? It looks like one to me and they are very handy. How cool! We would love the Purple Dusk one!! I like the Meadow Green! Twilight grey looks really good with a red dachshund! Oooh! We have had our eye on this leash for a while! So happy to see that it’s Ammo-approved! I love them all, but the grey one would be perfect with our orange Ruffwear front range harness!